The one-week commemoration of the late Kwadwo Asare Baffuor Acheampong popularly known us KABA is currently underway and it’s a heartbreaking event to observe. 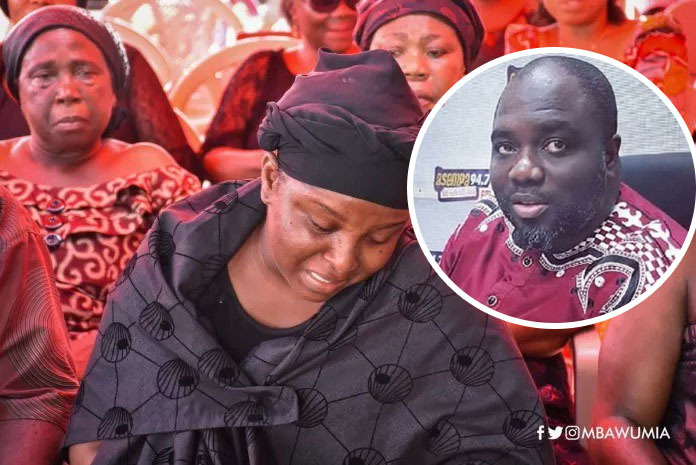 The family of KABA, all the colleagues of the late presenter, politician, celebrities as well as his loved ones are gathered at the premises of Multimedia LTD, Faanofa street-Komkomlemle, Accra to commemorate his passing. The wife of KABA, Valentina Ofori Afriyie is present at the one-week celebration. Valentina can hardly control her weeping as she is supported by close friends and family. It’s a heartbreaking scene.